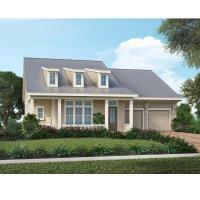 BABCOCK RANCH, Fla. (Feb. 13, 2018) — Babcock Ranch, the world’s first solar-powered town located just northeast of Fort Myers on State Road 31, has announced the Bartow model home by Stock Development is open for viewing. Located in Lake Timber, a neighborhood of 220 single-family lake- and preserve-view homes, the fully furnished Craftsman-style Bartow model is within walking and biking distance to Founder’s Square, the heart of Babcock Ranch. The three-bedroom, three-and-a-half-bath Bartow features a 2,822-square-foot open home design with gathering space for family and friends. Generous windows, including a trio in the study that overlook the wrap-around front porch, add natural light throughout the home and showcase its natural setting. Inspired by the environment of Babcock Ranch, the Clive Daniel Home design team of Rebekah Errett-Pikosky and Charlie Hansen selected warm, wood-plank tile and a palette of deep charcoal, creams, natural linens, deep kale and olive green to unify the model’s living spaces. In the gourmet kitchen, Mont Blanc granite complements warm espresso-stained cabinets, while an oversized granite-topped island provides additional casual seating. A pair of contemporary brushed-nickel chandeliers balance the great room’s dining and living spaces, where an accent wall of natural textured wall covering is flanked by tall recessed windows and soft pewter-upholstered bench seats. The great room’s sliding glass doors reveal an expansive outdoor living area, with additional room for casual dining and lounging overlooking the custom pool and spa. A wall of sophisticated sand and cream stripes anchors a neutral king-size tufted headboard and a pair of deep espresso nightstands in the owner’s suite, and twin leather armchairs create an intimate conversation area. Along with two spacious walk-in closets, the suite features a spa-like bath with walk-in shower, freestanding tub and a stellar gray quartz-topped dual vanity. Featuring neutral, geometric-print carpet, crisp upholstered headboards and sleek drum chandeliers, two stylish guest suites offer ample closets and private baths with quartz countertops. With a two-car garage, the Bartow is base priced from $439,990. Like all other homes in this “smart city,” the Bartow boasts a full gigabyte of fiber-optic connectivity direct to the home, supplying powerful internet for today’s online lifestyle. Babcock Ranch was created by Kitson & Partners with respect for the natural environment and the philosophy that smart growth and sustainability work hand in hand. Half of the town’s 18,000-acre footprint is set aside as greenways, parks and expansive lakes, providing recreation and scenic backdrops for Babcock Ranch’s homes and the Founder’s Square downtown district. Emphasizing a front-porch lifestyle to nurture a sense of community, Babcock Ranch promotes healthy living through a walkable community plan, 50 miles of planned biking and hiking trails, interconnected lakes for paddling enthusiasts, a robust calendar of exercise classes, and a health and wellness center operated by Lee Health at Founder’s Square scheduled to open in April, with health club facilities, nutrition counseling, therapeutic services, and medical offices opening in the summer. Table & Tap restaurant, Slater’s Goods and Provisions, Square Scoops Coffee & Creamery, Curry Creek Outfitters, and Babcock Neighborhood School welcomed the greater community to Founder’s Square even before the arrival of the town’s first residents in early January. A sprawling downtown park offers a lakefront bandshell, boardwalk, covered pavilions, and charging stations for electronics, including cars. An autonomous shuttle – part of the town’s mobility plan – provides transportation between homes and Founder’s Square. Babcock Ranch has seven home builders offering more than 50 home designs including twin villas, cottages, single-family executive, manor and custom homes featuring one- and two-story designs, two to six bedrooms, and 1,400 to 4,761 square feet of living space. Homes appeal to young millennials, families, empty nesters and retirees alike, with prices ranging from the low $200,000s to $1 million. Homes are built to Florida Green Building Coalition standards, emphasizing energy and water conservation. More than 30 model and quick-delivery homes are now open or under construction by Castle Harbour Homes, Florida Lifestyle Homes, Fox Premier Builders, Homes by Towne, Lennar, Pulte and Stock Classic Homes. Many models are open for viewing daily. For more information about Southwest Florida’s new hometown, visit the Discovery Center at 42850 Crescent Loop in Babcock Ranch, call 877-709-6620, or visit www.BabcockRanch.com.